DESPITE what Juno Gemes calls the ‘‘seductive powers’’ of digital photography, the photographer still prefers to shoot with film. Gemes travelled from her Hawkesbury River home on Friday night to open her series of photographs, Proof: Portraits of a Movement 1978-2003 at Gosford Regional Gallery. The exhibition, which will hang until July 22, is one of two exhibitions the gallery has opened to mark Reconciliation Week, this week. 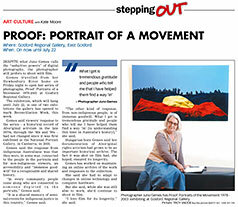 Gemes said viewers’ response to the series – a historical record of Aboriginal activism in the late 1970s, through the ’80s and ’90s – had not changed since it was first exhibited at the National Portrait Gallery, in Canberra, in 2003. Gemes said the response from indigenous Australians was that they were, in some way, connected to the people in the portraits and for non-indigenous viewers, an accessibility and ‘‘immense goodwill’’ for a recognisable and shared history. ‘‘In every community people come along who are connected to someone depicted in the portraits,’’ Gemes said. ‘‘It is a shared memory of seminal events for indigenous justice in this country,’’ Gemes said. ‘‘The other kind of response, from non-indigenous people, is of immense goodwill. What I get is tremendous gratitude and people who tell me I have helped them find a way ‘in’ [to understanding this time in Australia’s history],’’ she said. Hungarian-born Gemes said her documentation of Aboriginal rights activism had grown to be an important historical archive. The fact it was shot on film had, she hoped, ensured its longevity. Gemes has worked on maintaining an online archive of the work and responses to the collection. She said she had to adapt to changes in online technology and computer hardware. But she said, while she was still able to work, she’d continue to shoot in film. ‘‘I love film for its longevity,’’ she said. © City Weekly. Reprinted with permission.